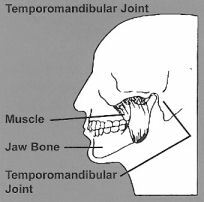 Temporomandibular Disorders, more commonly called“TMJ” by the layman is a term to describe a jaw joint disorder and the muscles that control the joints of the lower jaw. The head, neck and facial pain associated with TMD problems often masquerade as a multitude of other conditions such as sinus headaches, migraines, neck, shoulder stiffness and earaches. Fortunately, it can be treated successfully by a dentist who has the special required training that is needed to effectively treat the disorder. TMJ disorders (TMD) also known as Craniomandibular Dysfunction and Craniofacial Pain- refer to problems involving both the jaw joints and the muscles of the head, neck and face. These are the two joints that connect the jaw to the skull located on each side of the head in front of the ears. When these joints are displaced, they can cause mild discomfort to severe pain. The primary problem can be in the joints themselves, the muscles of the face and jaw or a combination of these. Because symptoms masquerade as so many other conditions, people travel from doctor to doctor in search of answers to pain relief. Many never think to seek out a dentist who is trained specifically in TMD such as Dr Barron. You can observe the action of the jaw join by placing your fingers on your jaw joints in front of your ears on the sides of your face. Open and close your mouth and you will be able to feel the movement. It should feel smooth without any clicking or popping when opening, closing or moving the jaw from side to side. Structures that make it possible to open and close your mouth include the bones, joints and muscles. Your teeth are inserted into your jaw bone. At the other end of your jaw bone are the TM joints which connect the jaw to the skull. Muscle spasm goes hand-in-hand with displaced jaw joints. Muscles attach both the bones and joints to allow movement to talk, chew, sing, shout and swallow. Any problem which prevents the complex system of muscles, bones and joints from working together in harmony may result in TMD. There are various ways this system can be disrupted, such as trauma (whiplash) or a blow to the face, connective disorders (arthritis) or skeletal malformation (posture) and airway disorders. Another cause of TMD relates to your teeth and your bite. Developmental jaw relationship discrepancies prevent your upper and lower teeth from coming together in a way that provides the proper positioning for the jaws. Contributing factors include missing teeth, misaligned teeth or back teeth that cannot erupt into the proper positioning. When this condition is prolonged, the body begins to compensate by involving muscles in other areas; the neck, throat, upper back, arms, fingers and pelvis. Another factor that impacts on TMD is stress. Stress overloads the autonomic nervous system causing the “fight or flight response” to be prolonged. Due to this prolonged state some people unconsciously grind and/or clench their teeth creating strain on the jaw joints. We all swallow about 2500 times throughout the day and night. The upper and lower teeth must come together firmly each time. When the TM Joints are unstable, the muscles must work harder than normal causing spasm, strain and muscle stiffness. Eventually muscles feel tired and painful. A viscious cycle begins of increased tension, muscle spasm and pain. When the jaw joint functions properly, the bones do not actually touch because of a thin “disc” of cartilage that rides between them. The disc acts as a cushion and allows the joint to move smoothly. Each disc is held in place by ligaments and guided by muscle. If these attachments are under dysfunctional movement for extended periods of time, the joint is pulled out of alignment usually pulling the disc forward or forward and inward. 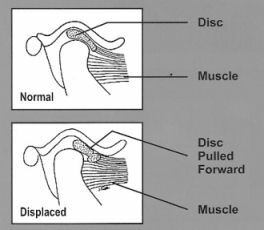 Since the disc no longer serves as a cushion, the joint itself now rubs against the bony socket and presses on pain fibers. Because problems associated with the jaw joints can be progressive, accurate and immediate diagnosis and treatment is crucial. Early treatment will help to avoid more damage such as degenerative arthritis. 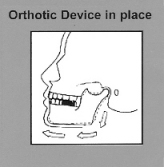 This device assists in positioning the TM joints in a proper relationship dictated by the body and the airway. Usually a temporary, easy-to-wear orthotic of clear acrylic is utilized to fit over the top and/or bottom teeth in the skill full and educated manner which produces the position which stabilizes the TM Joints. The muscles then are relaxed and out of spasm. 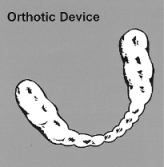 Usually following treatment all that is required is wearing the specifically positioned orthotic at night. For a small percentage of patients a Phase II level of therapy could be required. More infrequent, surgery to correct a damaged joint is only needed less than 3% of all TMD cases. Ultimately, with the conservative, non-surgical treatment your specially trained TMD dental provider delivers, the teeth, muscles and joints will all work together. If you have any signs or symptoms mentioned, talk to Dr. Melody A. Barron. Remember, your health is your most priceless possession. It is worth the investment.